You’ve already watched the first five seasons and you’re desperate to know how the series concludes. WARNING: Plot spoilers for House of Cards follow. Read at your own risk. When it first premiered, House of Cards broke new ground in entertainment. By gathering A-list Hollywood talent behind and in front of the cameras, Netflix proved that award-winning original programming could find life on streaming services just as comfortably as any broadcast network. It practically birthed the all-episodes-at-once release schedule that binge-watchers the world over now find commonplace. In many ways, it redefined what we should expect from a web-based series. Times have changed, however. Dozens of streaming services are cranking out hundreds, if not thousands, of original shows every year. Quality programming seems to emerge from every corner of the internet nowadays, and House of Cards just doesn’t stand out anymore. Its truncated final season confirms what we all suspected was true – what was once a bold experiment in a new age of television ends as just another mediocre show that’s overstayed its welcome. I won’t even attempt to sum up the insane narrative thus far, so here’s what’s new this season. Claire Underwood has assumed the presidency after the sudden death of her husband Frank, and everyone seems to want her out of the picture. Numerous new and returning characters weave in and out of the narrative, each believing Claire poses some kind of threat to themselves, their agendas, or democracy. The key player to watch is Doug Stamper, initially locked away in a mental hospital; he wants nothing more than to protect Frank’s legacy, even if that means inevitably taking on Claire herself. After just a few episodes, it becomes clear that House of Cards has grown rather toothless over the years. Gone are the major themes that once brought the show genuine weight – the cost of power, the horrors implicit in corruption, the psychological damage beget by a demanding job. 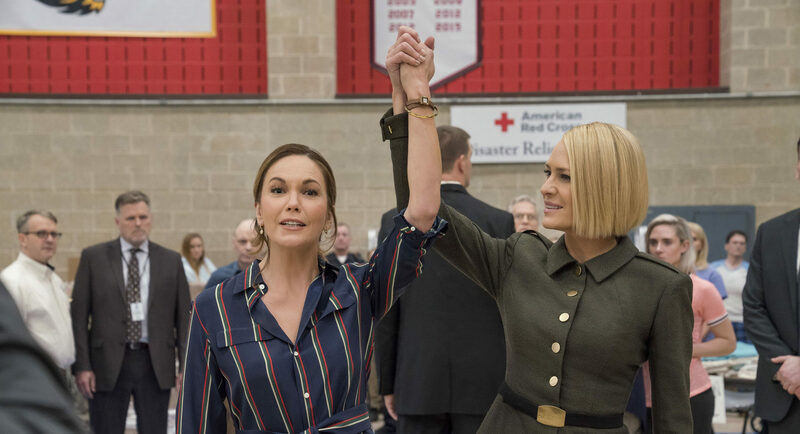 The show does hint at interesting changes in our political climate – the rise of women and minorities in government, how desperately old power clings to relevance – but instead it dances around them, too busy focusing on political intrigue that, when compared to the whirlwind that is current politics, simply isn’t very intriguing. Much of this “intrigue” arrives courtesy of newcomers Diane Lane and Greg Kinnear. They feature heavily as Annette and Bill Shepherd, yet another example of all-powerful, all-knowing characters coming out of nowhere to challenge whichever Underwood happens to be in power. They control Shepherd Unlimited, a powerful and shadowy firm that utilizes smartphone apps to siphon data from their users – again, an interesting idea that ultimately goes nowhere. The two harbor a very specific vision for the future of America and despise Claire for interfering with it, to the point where they stage multiple assassination attempts on her. Many of their stories – Annette’s fractured relationship with now-Vice President Mark Usher, Bill’s worsening illness – provide little dramatic weight and lack any meaningful resolution. The disjointedness stretches beyond the Shepherds as plotlines and characters come and go with no real sense of purpose. Former Secretary of State Cathy Durant is presumed dead, with an entire episode dedicated to her funeral, only for her to be left alive and assassinated later on to no dramatic end. The well-connected Jane Davis and Washington Herald boss Tom Hammerschmidt suffer similar fates, though to the show’s credit, the latter’s death is fairly shocking and emotional. Good luck figuring out what Seth Grayson brings to the table at this point. Time often skips forward between episodes, which leads to muddled continuity and the fun game of trying to figure out what’s changed before the opening credits roll. In fairness, the occasional extended monologue from Claire or unexpected plot development do get their point across, but these moments are few and far between. These brief glimpses of the show’s early tension and shock make the long stretches of uninspired downtime all the more frustrating. We’ve come so far from Zoe’s surprise murder in season 2. It’s in this way that House of Cards floats directionless toward its final episode, with an ending so abrupt and open-ended that it’s almost insulting. Nearly every plotline left running during this season is left unresolved; this isn’t inherently bad, but one would hope for some degree of catharsis as these myriad storylines conclude, and we get none of that. Many of the contortions the story endures to get to the finale may stretch your disbelief to its breaking point, and it’s unfortunate that the pieces don’t fall into place in a more satisfying way. Of course, there’s also the big elephant in the room. As the stern and relentless Frank Underwood, Kevin Spacey brought an almost magnetic gravitas to House of Cards, creating an imposing and fascinating character that saved even the show’s most questionable scripts. Spacey’s sexual assault allegations led to his deserved firing, but Frank’s presence looms large over this final season, even in Spacey’s absence. Much of the overall plot focuses on Claire struggling to step out of her deceased husband’s shadow, to tarnish his legacy while building hers. Characters reference Frank constantly, with Doug’s loyalty to him reaching new and even more implausible heights. With Spacey gone, Robin Wright’s performance as Claire takes center stage, and while she supplies her own excellent sense of dignity and charm, it’s just not enough. So that’s how it ends. Inevitably, the proverbial house of cards must fall. Instead of a spectacular implosion upon a shaky foundation, some brief and passing storm knocks the cards down, each one drifting aimlessly in the rain before landing. It’s unfortunate to see a series of any length end on a disappointing note, but that’s exactly where House of Cards ends up. Spacey’s firing forced the show’s creative staff to rework this season very quickly, circumstances that no doubt led to its haphazard quality. Even with this in mind, the show seems content to fade into the background with its bag of tricks thoroughly depleted.